Every four years soccer related Sankey diagrams pop up. For the 2010 FIFA worldcup in South Africa I featured this figure. In 2014 there was the beautiful “The Road to Rio” diagram from an inflight magazine. For the upcoming 2018 FIFA worldcup in Russia, two researchers have taken a more scientific approach. Their prediction model uses mathematical methods to determine who will most likely be handed the gold trophy on July 15 in Moscow. If you are into Monte Carlo simulations, bivariate and nested Poisson regression models, Brier score and Rank-Probability-Score (RPS) then you will enjoy the paper ‘On ELO Based Prediction Models for the FIFA Worldcup 2018’ by Lorenz A. Gilch and Sebastian Müller. 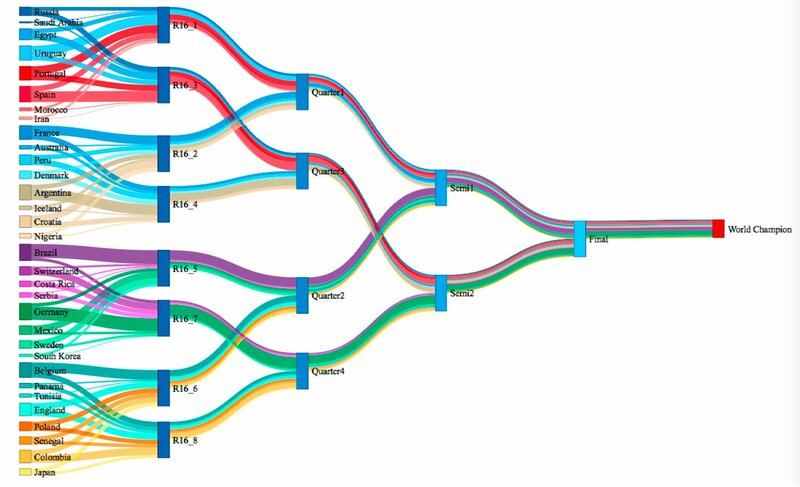 Groups and teams are color-coded, and the wider the band in the Sankey diagram, the higher the probability. So, according to this model, which takes into account performance of the teams since 2010, a nation from the green group will become the world champion. Purple runs with a probability of 18% and red with 14% (for the detailed values that form the basis for this diagram please see table 12 on page 15 of the paper). Well, we’ll see, and in five weeks we will know the outcome. Whether you trust this more scientific approach, or whether you would rather go with a straight-forward Paul the Octopus divination … I hope you enjoy watching the matches! 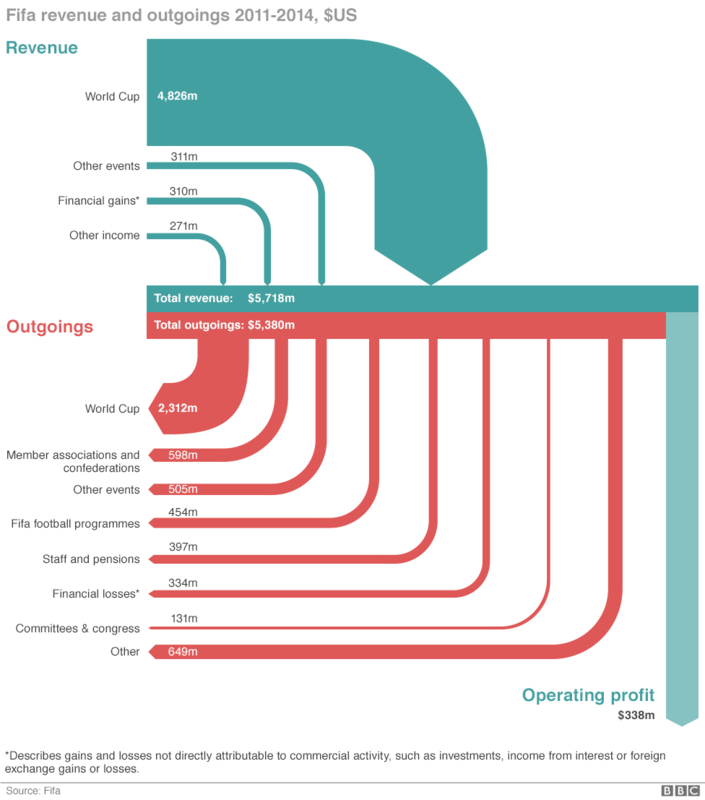 This diagram is by Salim Qurashi and Gerry Fletcher for the May 29, 2015 BBC News article ‘How Fifa makes and spends its money’ by Paul Sargeant. The data is based on FIFA financial statements for 2011 through 2014. Flows in US$. The diagram depicts how “the Zurich-based multi-million-[dollar] organisation make its money and what does it spend it on?”. This is only “sort of a Sankey diagram” as Brendan Barry “the man behind Coffee Spoons” notes. The light blue arrow for “operating profits” represents the balance difference between turquoise incoming and red outgoing flows. The infographic authors chose to set the arrows apart, which make it difficult to verify if arrow widths are to scale. (2) Not all flows are to scale: Compare the width of the light blue arrow for “operating profits” (338m) with another flow in the 300m-range such as “Financial Losses” (331m). An unintended flaw?